Hi manuel, both commands brought me to the Qt5 configuration tool, I changed the font to match the system font settings, everything is typographically great now, thank you for saving my eyes. I just completed a fresh install of Antergos selecting the Xfce environment. 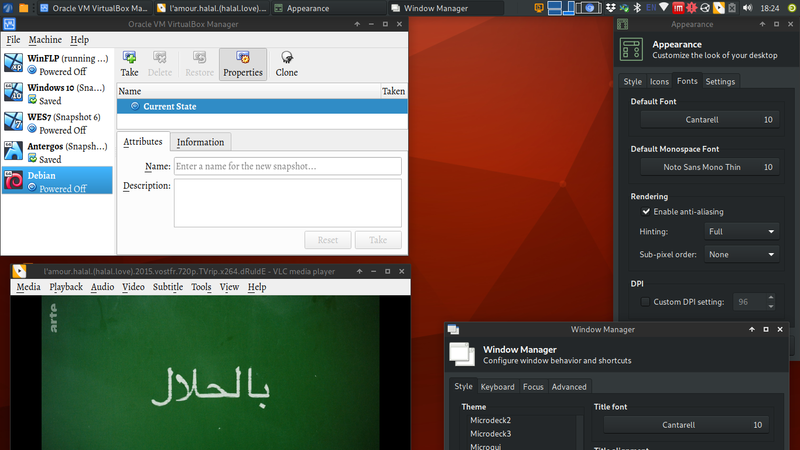 Now, certain apps like VLC and VirtualBox have a serif font that is very ugly on the screen. It’s the same font so I don’t think it’s a problem with the apps themselves (and there’s nowhere inside them to change their font). I’ve looked in various system settings but changing fonts there don’t seem to apply to these apps. I don’t remember changing anything after installing the OS, other than using the my home folder from previous installations (Antergos running XFCE, then KDE, then Gnome), so perhaps there are leftover configs affecting things. Hmm, I think I’ve confused myself. I just booted into the live environment to find these configs, and it’s apparently running Gnome shell. The xfce4 environment that I was referring to was actually from the Manjaro live cd, which I tried to install 3x but failed to get it to boot. So in frustration I tried Antergos which worked nicely, but while writing this post, forgot it used Gnome, and instead got the two distros mixed up. So now it seems as if I’ve just installed an alternate desktop environment like one would be able to in any distro, which would of course use its own config (e.g. Ubuntu ships with its Unity/Gnome skin but installing xfce doesn’t come with any Ubuntu modifications.) In this case, does Antergos have customizations to xfce, or is the only “skin” of Antergos its Gnome look? Hello, sorry if this is a newbie question. I’ve just installed Antergos, and it’s running well. I really liked the live environment’s xfce style, and was surprised that the post-installation look was actually a blank state, although I guess that’s for the user to customize. Through changing the system theme, cursor, icons (numix), panel (adding the whisker menu), it’s mostly there. However there are some small tidbits such as meta + arrow keys not snapping the windows (Like Windows’ aero snap) as well as dragging down from the panel with a maximized window, that doesn’t pull the window down. Is there a package that I can install for these, or do I need to edit some configs manually, could someone point me in the right direction of where to look if so? Basically I would like the look and feel of xfce (also some other things not related to the desktop environment too, such as login screen) to resemble that of the xfce live cd.